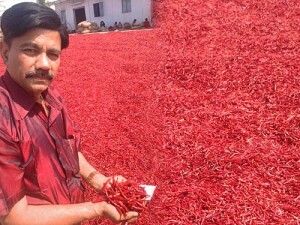 We are Leading Exporters of Dried Red Chilli’s, Etc to varies countries. We pride ourselves in being the leading Marketing and distributor of a comprehensive range of products of Dried Red Chilli’s . We have a global reach in sourcing new high quality products and delivering them competitively. From ancient times, India has maintained its top position as the largest spices exporters and manufacturers in the world. India is a superpower in global spice market - meeting almost 50% of worldwide demand. Dry Red chillyis among the largest traded spices in India & overseas market. chillyis considered as the king of spices. India accounts for 25% of global chiili production and a major exporter of all varieties of chilli. Indian spices mainly, Dry red chillyenjoys huge demand in world market due to its rich aroma, prickly hot taste, rich red color and health benefits. Dry red chillyis used all over the world for adding special taste and zing in popular food recipes. Clients, domestic or overseas, are welcome to join hands with us to have a long lasting business association. We assure of quality, timely delivery, world class packaging, complete logistics support, and total customer satisfaction. chillyis hot and stimulating with very less aroma when eaten. You can dry, freeze, or smoke the chillies to preserve them. Do not forget to break the stalks. This will preserve red chillyfor longer time. You can store them in air tight container and keep it away from heat. Health Benefits of Chilli Dry red chillyis rich in vitamin C (185 mg/100g) and protien (11.98 g/100g). Red chillyis good for slimming down as it burns the calorie easily. Chillies stimulate the appetite, help to clear the lungs, and stimulate digestive system. Our red chilli’s are mature pods with have larger seeds, more spicy and sharp in appearance. Our Chilli’s are valued principally for their high pungency and color. We are exporting Chilli’s in the form of dried chilli’s. We are exporting to Varies countries such as Mexico, Malaysia, Sri Lanka, Bangladesh, the Middle East, Far East, Etc. • Packing : 10 Kg in a Pp bag / Fresh Jute Bag • Such : 10 Kg X 10 Kg bags made as a Bale packing ( Compressed ) • Load ability : 18.5 Mt in a 40 Ft HC Container.